A six-year-old in a tier-2 city in India and a 30-year-old in Africa share a Chennai connection. 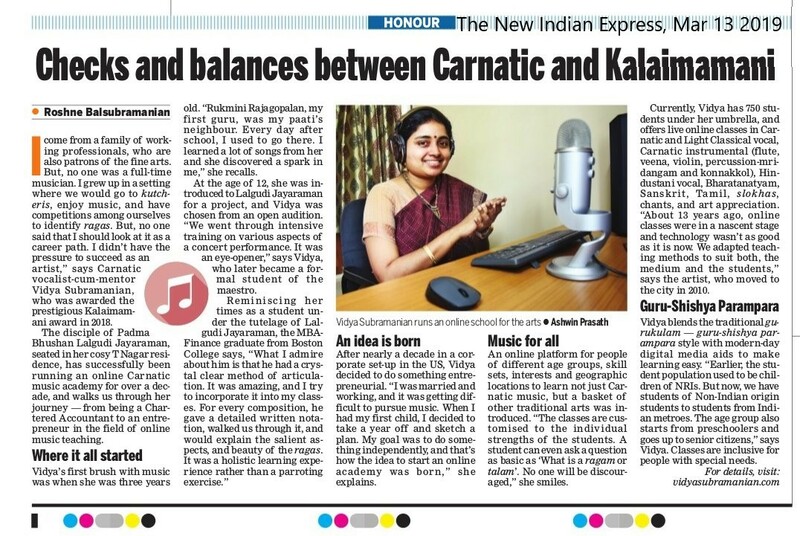 They are both taught Tamil and Sanskrit by city singer Vidya Subramanian via Skype. One tends to believe that God is indeed partial, while coming across a multi-talented personality like Vidya Subramanian. A recipient of several awards and a sought-after online music teacher, Vidya is also a gold medalist in Chartered Accountancy and an MBA from Boston College in the US. Not to mention of her down-to-earth demeanour which adds to her glowing persona. 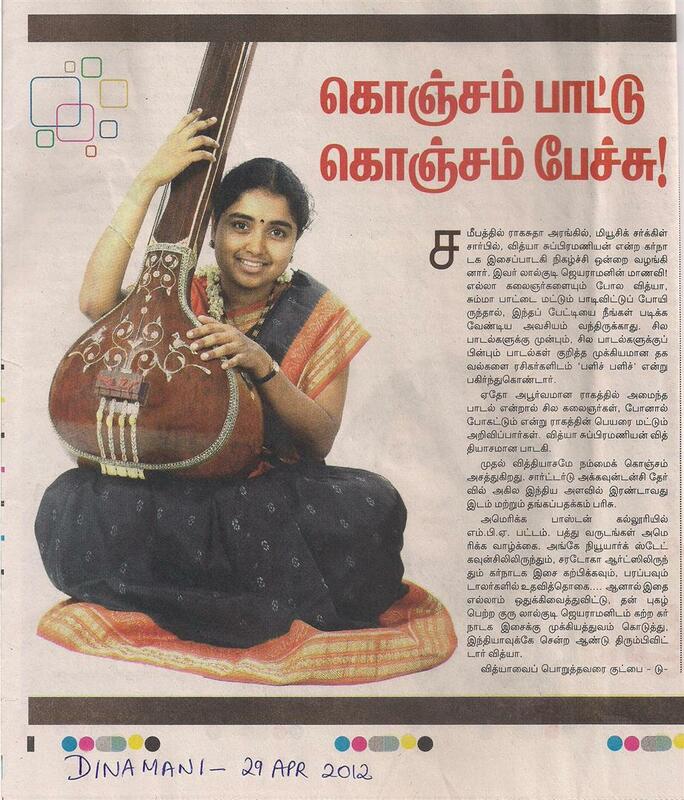 A disciple of music maestro Lalgudi Jayaraman, Vidya took her baby steps in Carnatic music at the age of three. 'My first Guru was Smt Rukmini Rajgopalan', she says. 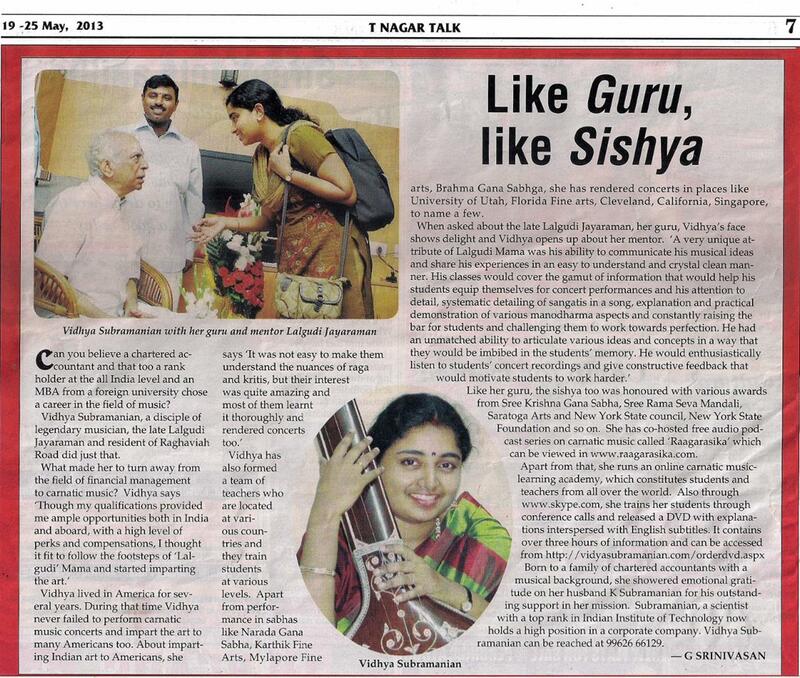 Coming under the tutelage of Lalgudi in 1993, Vidya attributes her keen music sense to her Guru. 'He was extremely good at articulating his knowledge. He would encourage his students to think, developing their swara nyanam. His years of experience would effortlessly translate in class', she recollects. It was the need to stay with her young kids and her inherent passion for teaching, which encouraged Vidya to leave behind a lucrative career abroad and return to India. 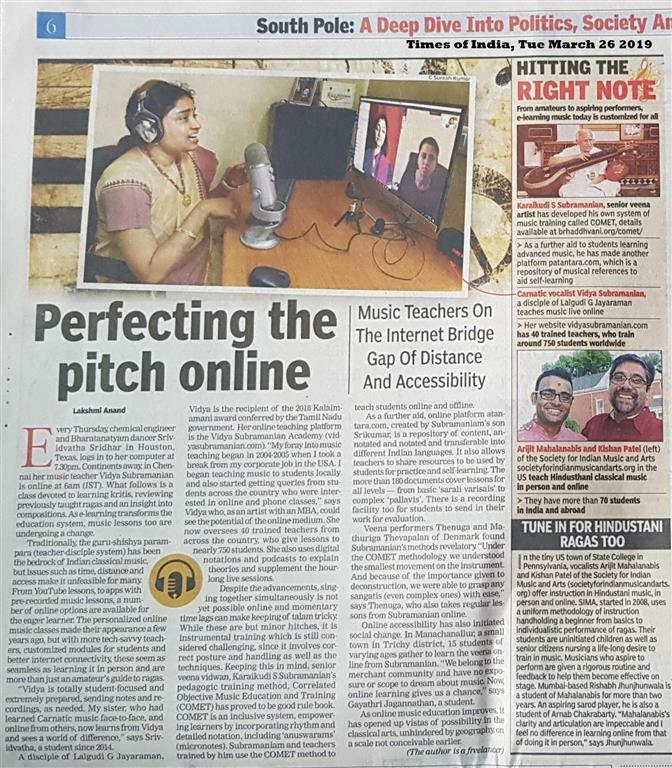 The result was 'vidyasubramanian.com', a digital teaching portal which offers Carnatic vocal classes over internet (Skype) / phone, catering to all levels of learners. 'The huge scope in the field of online teaching was an important factor', she explains. In addition to the website, Vidya also co-owns 'raagarasika.com', a series of free podcasts, with each episode covering a specific topic of interest such as a raaga, composition, composer, place, or a musical term. So has her academic excellence helped in her musical career? 'Certainly. It is also the vice-versa', she says. 'Communication skills which are essential in teaching, are enhanced with academic knowledge. It helps you to tackle issues which might crop up during online teaching, such as time lag and the like. A creative art form like carnatic music, requires a disciplined approach, which can be imbibed by studying for a strenuous course like chartered accountancy. Also, the soothing nature of music helps to relieve the stress associated with academics'. 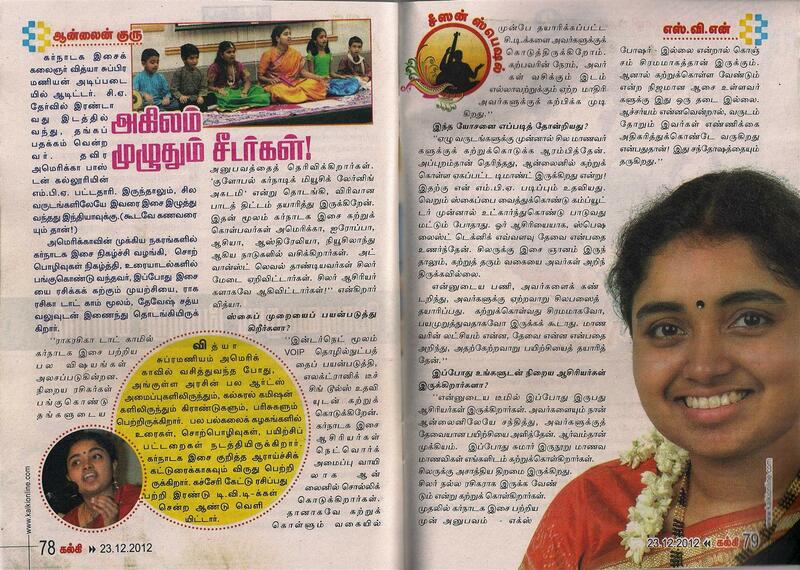 'Every concert is a learning experience', asserts Vidya whose first concert was at the age of 12. 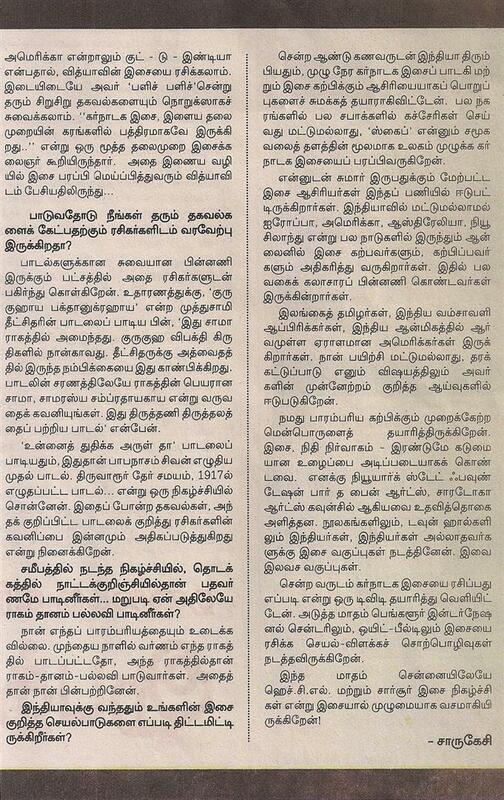 'It was at the Srinivasa Sastri Hall in Mylapore', she smiles. 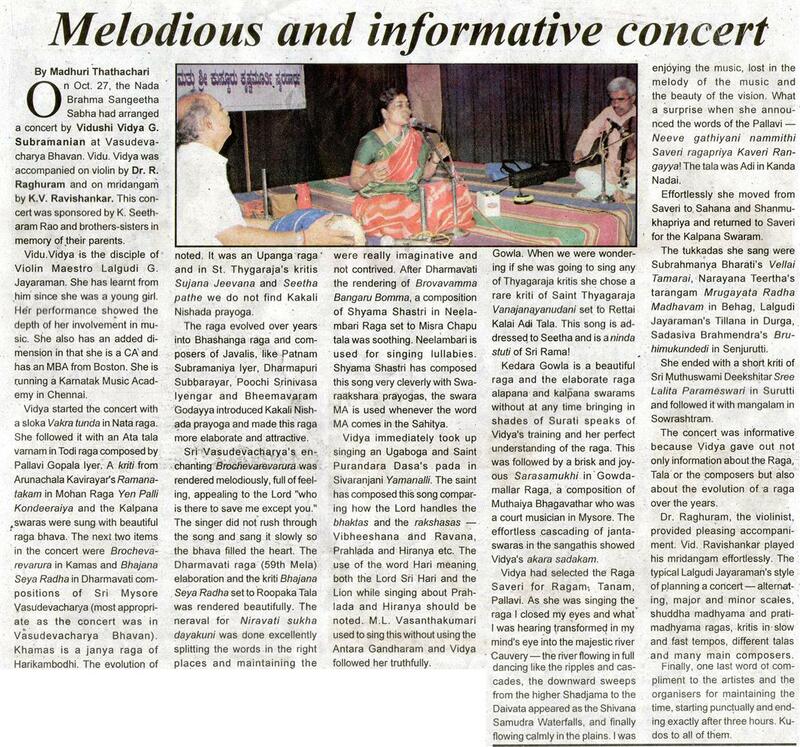 For each of her concert, she reads up about the composition, identifying its unique features and have it presented to the audience, a practice relatively new to Chennai rasikas. 'If we want the art form to reach out to a larger section, then musicians should share a good rapport with their audience. Sharing tidbits and answering their queries are small steps in that direction. One should remember that everyone is a rasika in their own right', she affirms. Truly living up to the 'cultural capital' tag, Chennai is the only city which celebrates an event like the December music season, as a festival of sorts. 'It is only here that all the stakeholders: the musicians, audience and organisations have come together, to create a conducive platform for artistes. The December music season rejuvenates musicians. With the right kind of marketing and support, the festival can be made as an international event of global standards', she says. Is networking essential to build a musician's profile? 'Connections might only provide you the initial recognition, but it is talent which will ultimately help to cement oneself in the industry. It is the responsibility of the sabhas to provide equal opportunities to everyone. There should be transparency in the selection process of the candidates, as followed by art organisations abroad. Rotation system can be put to practice and the websites of the sabhas should have clarity on whom/where to approach', she points out. 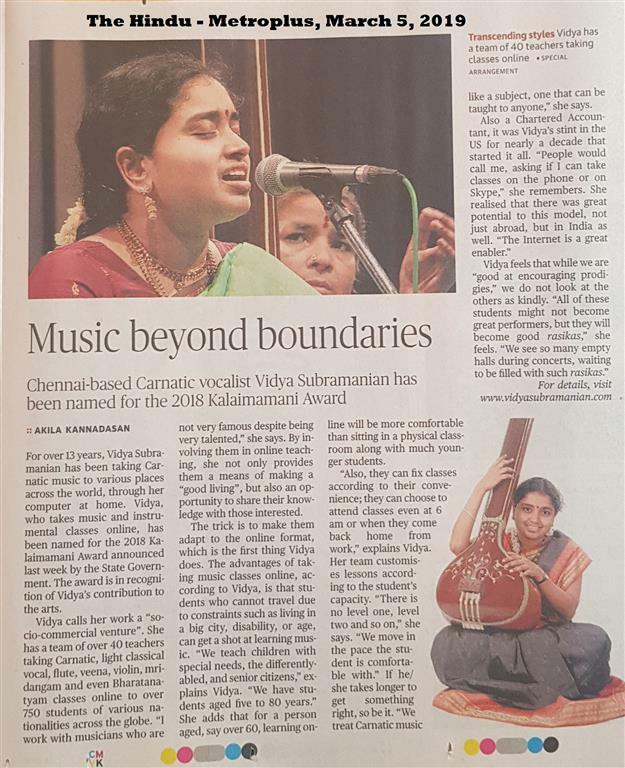 'We should be thankful to the older generation of singers for having inspired many to follow suit', adds Vidya whose personal favourite yesteryear singers, besides her legendary Guru, include M S Subbulakshmi, M L Vasantha Kumari, D K Pattamal and K V Narayanaswamy and Semmangudi Srinivasa Iyer. Many foreign students are either professional musicians in their own countries, or trying to establish themselves in the world of music and dance. A French woman, who was learning classical southern Indian ragas from her teacher, Vidya Subramanian, is a jazz player in her country. She says she is learning ragas "from Vidya with a view to improvising and using it whenever I can in jazz. It'll give me an edge". Youthful Vidya Subramnian returned to her home town Chennai three years ago having lived and worked in the US for 15 years, to raise her children in India. 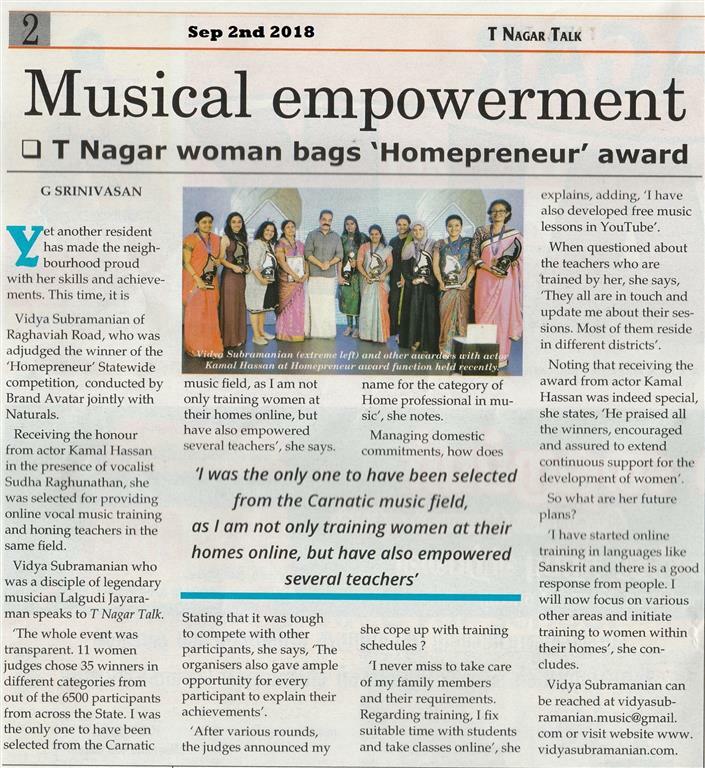 She left a lucrative career as a chartered accountant but quickly re-established herself in Chennai in classical singing. Today she is a leading online teacher of classical singing. She works alongside a group of teachers to impart training to eager students overseas. "I have no regrets. I had to look after my family. So, I decided to take up online teaching from home." Teaching online means that Vidya Subramanian can also look after her children at home Vidya Subramanian says working from home allows her to look after her children, and gives her the freedom to choose what time she wants to take classes. ...India once had a great tradition of disciples learning at the feet of their gurus. That tradition seems to have been revived - in virtual world - thanks to technology. © Vidya Subramanian. All rights reserved.